The pen knife is a nifty little self-defense item. It looks exactly like any regular pen because it is one and writes like one, yet it conceals a useful self-defense item: a small and very sharp blade. These letter openers are actual pens that could save your life. They look like an ordinary pen, but feature a 2.13 inch blade that is revealed by pulling the two halves apart. The color options are Black, Silver, or Gold. These pen knifes are easily concealed so you can take them with you just about anywhere. No one will think that this expensive looking writing instrument actually contains a knife that can be unsheathed very quickly. A good thing to remember about self defense is to always find a way to get yourself an advantage over your attacker. An attacker’s goal is to harm you, either by stealing something from you or hurting you physically. During an attack, it could be quite difficult to position yourself in a manner wherein you can defend yourself. At close combat, stopping an attacker can be a challenge. By using a pen knife, you could protect yourself from physical harm and stop your attacker effectively. Here are tips for using pen knife self defense products. 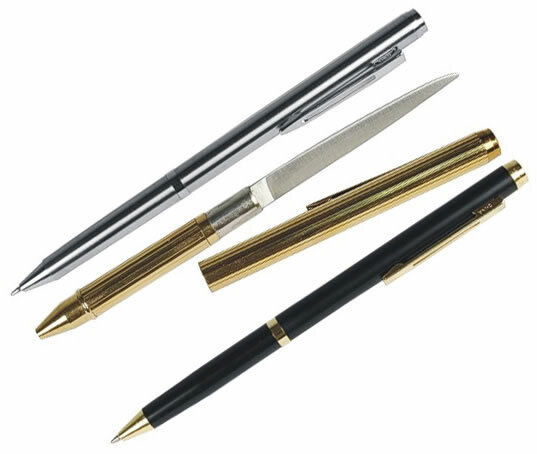 Pen knives are designed to be concealed, which is why they are cleverly disguised as regular pens. When you first get your pen knife examine it carefully. The blade is hidden inside the body of the pen. Be very careful pulling apart the two ends for the first time. The part that writes is your handle and the "sheath" is the top end. Familiarize yourself with how the pen feels in your hand. You should be able to tell which end is the handle and which end holds the blade without even looking at the pen. This will ensure that you will know exactly how to hold the pen knife in case of an emergency. The key to using pen knives as effective self defense products is to be able to access it immediately. In case of attack, you’ll usually have only seconds to act defensively. You should be able to use these precious moments in getting the pen knife, opening it and using it against your attacker. When traveling, driving or walking, keep the pen knife close to the body. Slip it into your front or back pocket or keep it in your shirt pocket. If carrying a purse, make sure the pen knife is close to the opening so you can access it immediately. If you have to dig in your bag to get it, you’ll be placed at a huge disadvantage in just a short time. The more comfortable you are holding your pen knife, the more effective you’ll be. Make sure to practice holding, opening and using your pen knife in your home. Practice different styles of thrusts or knife attacks. Stabbing an opponent, for example, is an action that can be done as an overhand or underhand attack, depending on your current position and available opportunity. If you know how to use your weapon efficiently, the more likely you’ll be successful in defending yourself and the least likely you’ll injure yourself. Remember that these can be lethal weapons as well. Use them only if you truly have to but don’t hesitate if your life is in danger. Pen knife self defense is dangerous but you can certainly gain an advantage by having this hidden blade readily available.